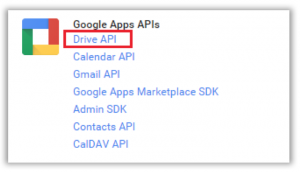 To use this feature, the administrator must enable the Google Drive API in the Google Administrative Console and configure the system to allow your Foldr installation to call the Google API to allow this feature to function correctly. 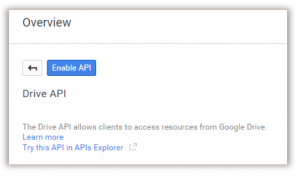 https://console.developers.google.com/apis using your administrative account. 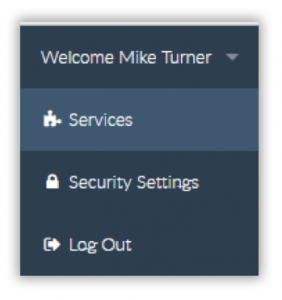 Navigate to the ‘Credentials’ section in the left hand panel where you can configure credentials for your project. 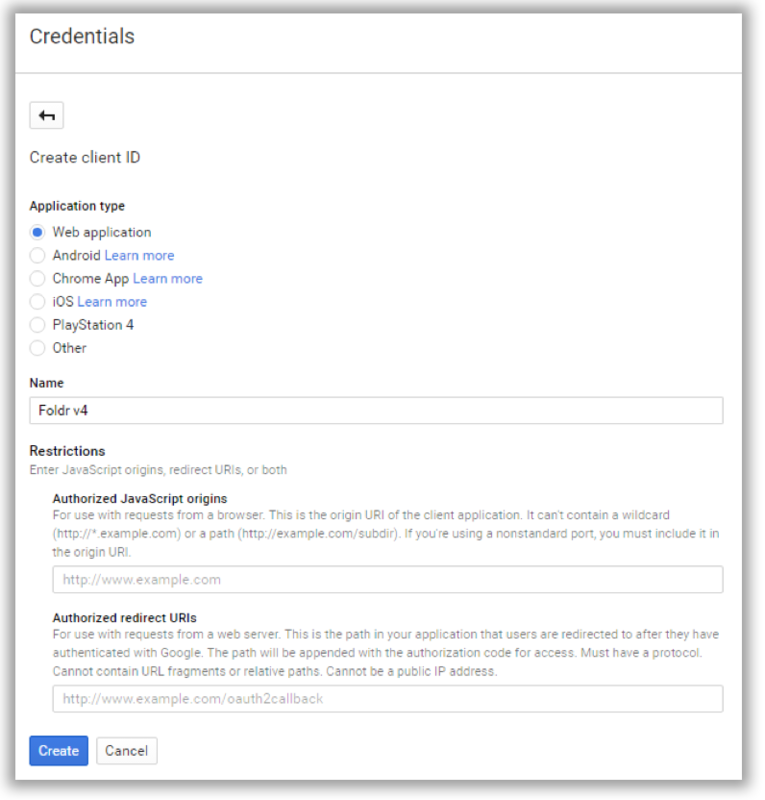 You will be prompted to create credentials, select ‘OAuth client ID’ from the available list and you will then be prompted to create/configure a consent screen. All other fields are optional, finally click SAVE. Click SAVE and you will be shown your client ID and Secret (the fields below are intentionally shown blank below but they will be populated automatically). 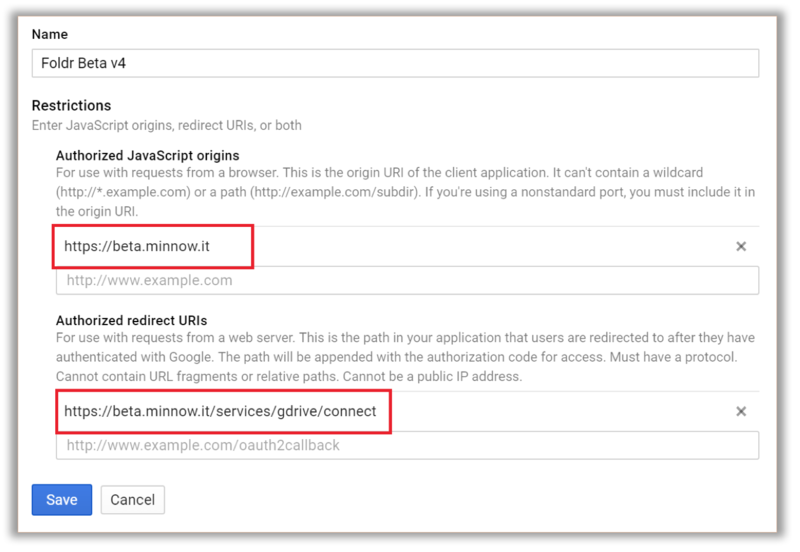 Log into Foldr Settings >> Services >> Google Apps >> Enable Google Apps integration and copy / paste the Client ID and Client Secret. Finally, click SAVE CHANGES. 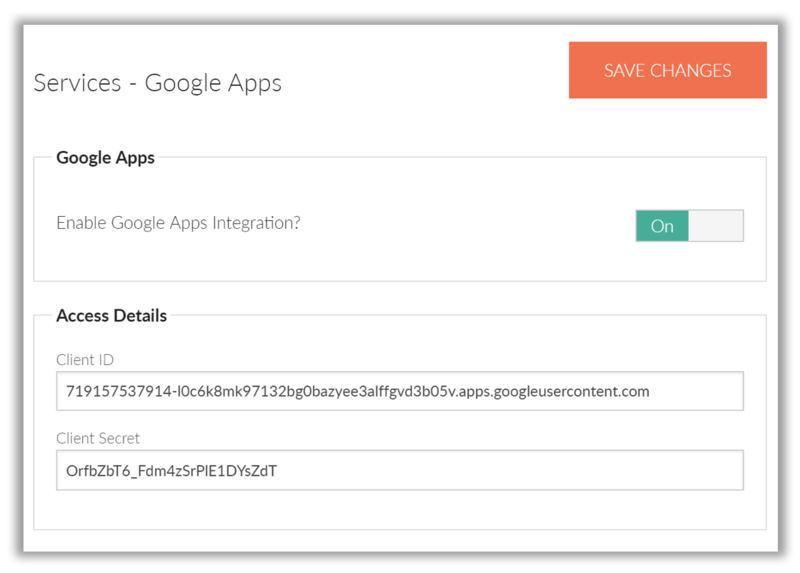 Users are now able to link their Google account when logged into Foldr using the SERVICES menu item in the web app. Services can be located top right in the Foldr user interface once you click on your name. Click ‘Link your Google Account’ and you will be prompted to sign into Google. Click ‘Allow’ to accept the following consent dialog. You should see a brief please wait screen and your Google Account will now be linked to Foldr. 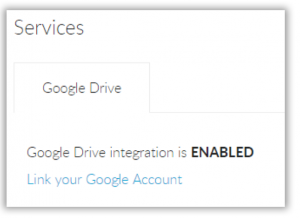 Users can unlink a Google Account at any time by clicking Services >> Unlink Google Account. 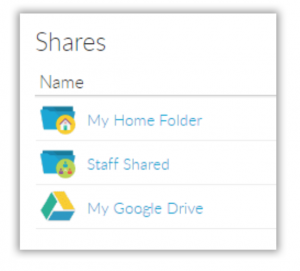 Add a new Share under Foldr Settings using the share path %googledrive% if you would like to present all linked users Google Drive storage area within the Foldr interface. 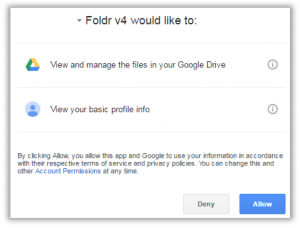 NOTE – Google Drive is accessible for users using the web interface and mobile apps but is hidden from WebDAV connections, due to the lack of easily readable file names and paths on Google Drive..
Providing the API has been enabled correctly, users should now see their Google Drive in the main Shares list and Edit in Google Drive should be available when they click on local or cloud based documents. 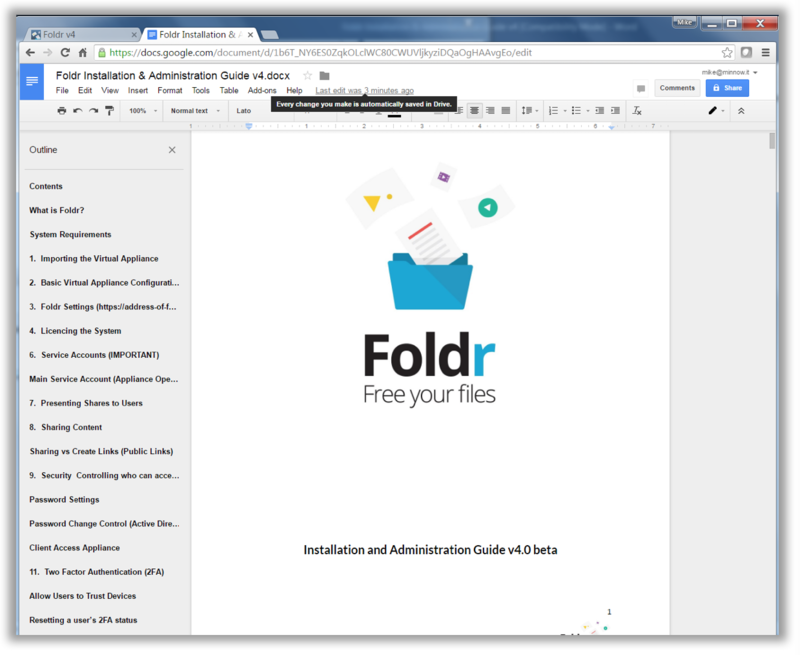 Example – Edit a word document held on network based SMB share in Google Drive. 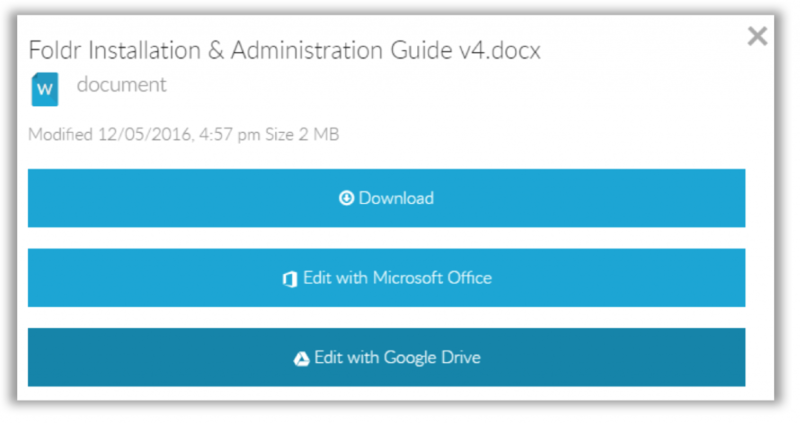 The user selects the document and clicks ‘Edit with Google Drive’, document is sent to Google Drive and is now available for editing in the web browser in the Docs interface.